Ben Roethlisberger is now 26-4 as a starter in the NFL. That's an 0.867 winning ratio. If Ben were a baseball team, he'd win 140 games per year. Basically, in a five-man rotation, the first four pitchers would win every game they started, and the fifth pitcher would win a few too! Calling Plummer "Jake the Mistake" (or flake) does a disservice to the masterful game plan the Steelers called and executed. The Steelers forced Jake to make the mistakes - with pressure and by putting Denver in a massive 17-3 hole in the first half. I've disliked Cowher for years - for good reason - but Ben and his winning skill seem to have forced Cowher around a corner. No longer is it "run, run, run and if that doesn't work run some more." Cowher still turtles a little - the prevent defense let the Doncos score 14 points in the second half, almost making a game of it - but when you're up by 21 I'll allow a little turtling. 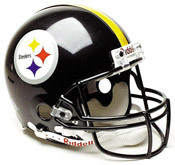 I've said that if the Steelers ever won a Super Bowl it would be in spite of Bill Cowher. The Bill Cowher of which I spoke seems to have died when the Steelers lost to the Bengals earlier this season. A new Bill Cowher - one who trusts his quarterback - seems to have emerged. The Steelers are something like 103-1-1 when they lead by 11 points (at any point in a game) under Bill Cowher. The one tie was a fucked up Atlanta game from five or six years ago. The one loss was to the Bengals two years ago (to John Kitna, IIRC). The NFL talking heads are pointing the way towards an AFC victory, once again, in the Super Bowl. I think that it will be a close game. Hasselbeck is a smart QB, Shaun Alexander is a wily, elusive running back, and the Seahawks D is under-rated. Both teams are relatively healthy. I'm not yet sure what my plans are, except to say that I'll be watching. But to bring things full circle, Ben will be the second youngest quarterback to ever start the Super Bowl. 26-4 as a starter in the NFL. He wins 87% of the games he plays. Think about that for a second. In today's parity-ridden NFL, a rookie was 14-0 in his first regular season (15-1 overall) and has gone to two straight AFC Championship games. P.S. Here's to hoping the Steelers elect to wear their road jerseys (they're the host team, so they get to choose), though wearing "home" jerseys given Bettis' ties to the area may be a sentimental pick, too. I vote for road jerseys given their play and attitude of late.